Evaluate student comprehension for any lesson by tracking student assessment performance with Quiz Scores. With this tool, teachers can analyze data for both the formative in-lesson quizzes and summative end of unit tests. Track scores for individual students, or the section as a whole. 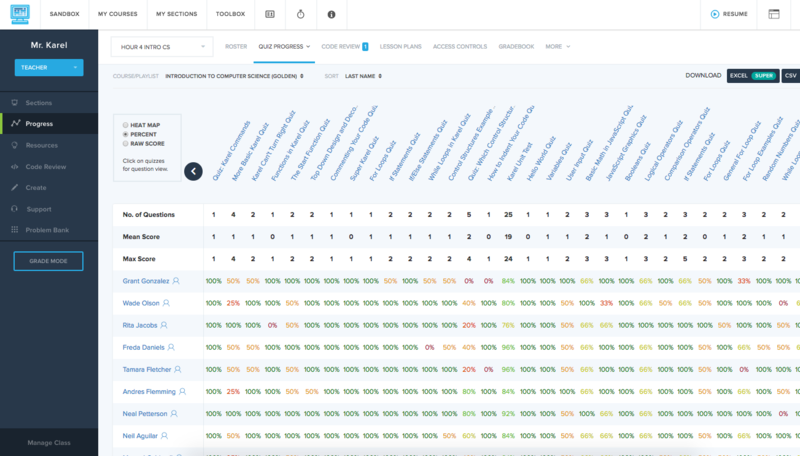 Teachers can view all quiz scores and the mean score for each quiz; or dive deeper on a specific quiz and view a question-by-question breakdown of student performance. 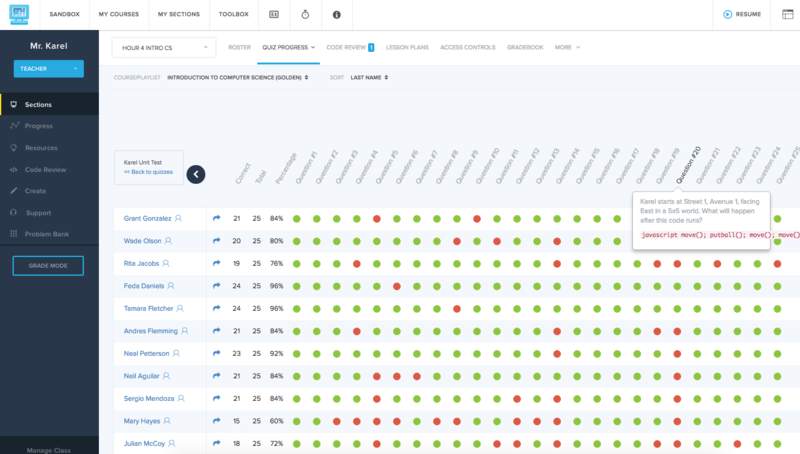 There are multiple views available with Quiz Scores to help teachers customize how they want to visualize student performance. Track Quiz Scores through Heat Map, Percentage, or Raw Score. Single quiz breakdowns are also available to dive deeper into student performance and look at scores on a question by question basis. The actual quiz question is also available from the question by question breakdown. The Quiz Scores tool allows teachers to quickly gauge student performance and gain insight into student comprehension of every lesson. Teachers can easily pick out the quizzes that specific students or the entire section is struggling with, and then use the question-by-question breakdown to get a pulse of which concepts students need to spend more time on. This allows teachers to spend time with students as effectively as possible, by honing in on exactly where students need additional practice. To find the Quiz Scores tools, click on the Toolbox at the top of any page and visit the Progress menu.